How could they? Arj, Tam, and Mira are spending their summer holidays in Elathoor, a village in Kerala. As they have their holidays spawned with fun and frolic, planting mud bombs and playing hide and seek, that Thud in the middle of the night triggers them to be on a mission for the rest of their vacation. The story is set in a village in Kerala. The descriptions are so raw that we become a member of the Doctor’s House, the only one in the village. The characters or the ‘suspects’ are introduced informally as they all together make a day in the life at Elathoor. There is Pinching Kodavis, the Dumdumchechi who wakes up early and milks the cows, the DoubleMean fisherwoman who starves the cat, and Pitamma who feeds these kids scrumptious food. As the kids set out on their investigative journey, we learn more about them, their lives and the secrets they live with. As the investigation progresses, the kids have their checklists updated with the prime suspects. Who could it possibly be? 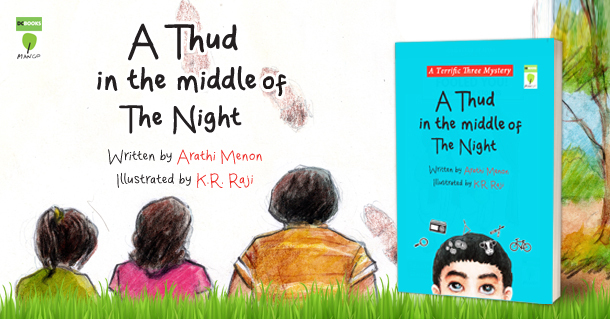 A Thud in the Middle of the Night by Arathi Menon is a clever and earthy piece of fiction. It serves as an escape to a sphere of adventure while we remain grounded with the gravity of the characters and the deft stokes we picture them in.